On Vancouver Island, a local angling club is taking the lead in a project to improve fish habitat conditions at a popular urban lake. 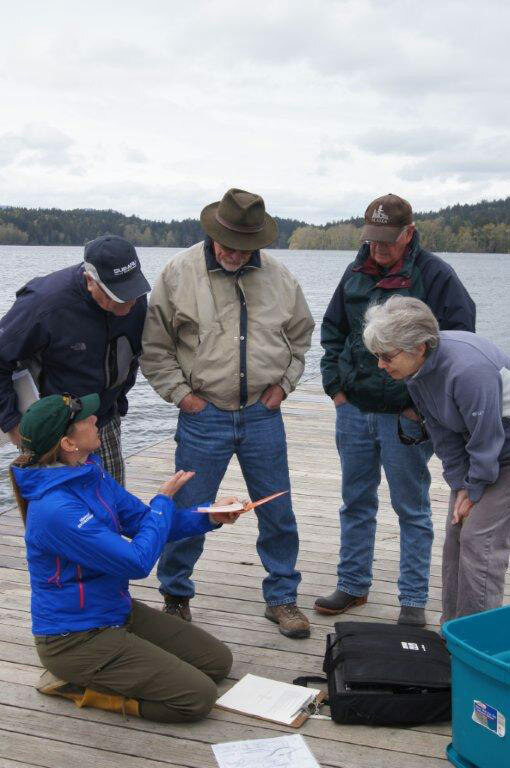 The Victoria Golden Rods and Reels (VGRR)’s Elk Lake Enhancement proposal is one of 116 projects recently approved by the Habitat Conservation Trust Foundation . VGRR received a $5,000 seed grant to support the creation of a plan that will address the lake’s declining water quality, a problem which has impacted fish and wildlife, along with a broad spectrum of recreational users. Concerns around Elk Lake’s water quality were most recently publicized in January, when the lake’s annual polar bear swim had to be relocated due to the presence of a toxic algal bloom. The blue-green surface scum was confirmed to be cyanobacteria, a photosynthetic bacterium that thrives in conditions where excess nutrients are present in the water. Blooms of cyanobacteria have been an ongoing problem in Elk Lake, where phosphorous levels have been elevated through residential and agricultural development of the surrounding land. Since 2009, the lake has seen at least four such blooms, which can cause serious illness or even death in humans, pets, and wildlife. Though the events tend to be short-lived, the mass die-offs of bacteria at the end the blooms can deplete the lake of oxygen, creating dangerous conditions for sensitive fish species such as rainbow trout. Project leader and VGRR club member Mick Collins says that, despite regular stocking by the Freshwater Fisheries Society of BC (FFSBC), there are serious concerns among anglers for the future of the Elk Lake trout fishery. Elk Lake remains an important resource for local anglers, with an estimated 14,000 angler days per year, the most heavily fished lake on Vancouver Island. It is also hosts FFSBC’s popular Learn to Fish program, which teaches basic angling skills to youth and adults. And the lake’s appeal is not limited to anglers: it’s popular with swimmers, dog walkers, and is home to Canada’s National Rowing Team. Through their HCTF-funded project, VGRR is committed to bringing together the many stakeholders to find feasible, scientifically-sound solutions for the lake. Volunteers from the club have already began working with the Ministry of Environment to carry out a regular water quality monitoring program to provide the data necessary for deciding on the best course of action (watch the video of highlights from the volunteer training session below). VGRR is also planning to establish a lake stewardship group and organize a public meeting to allow stakeholders to come together to discuss the issue – and explore potential solutions. The water quality problems facing Elk Lake are not unique: there are numerous examples of relatively shallow, nutrient-loaded lakes in BC that have faced similar issues and overcome them. The project team will be looking at these case studies when designing the plan for Elk Lake. Restoration options that will be considered include weed cutting, reduction of nutrient inflows, and lake aeration. Once the initial planning stage is complete, the club will be able to put forward a full proposal to HCTF and other potential partner organizations requesting funding to execute the plan. The Victoria Golden Rods and Reels club is a great example of anglers working to protect the trout fishery resource, to the benefit of other species and recreational users. If your club or organization is interested in working on a conservation project, visit our Grant Overview page to learn more about available funding.